“What? I could never do a triathlon!” a mother of three said to me in the checkout line of the grocery store, eyeballing my race t-shirt with the swim, bike and run stick figures prancing across it. In fact, I hear “YOU did a triathlon?” and “I could never do a triathlon!” a surprising amount. I look like your average mom of two. I have a job, bills to pay and of course, all the stress that comes with these responsibilities. I’m a size 10 on a great day, a size 12 on the average day and a solid 14 during the holidays. There’s nothing overly athletic about me, and I certainly don’t look like a triathlete. But like a duck on the surface of the water, whats underneath, paddling, is not always easy to see, and is even easier to underestimate. I am here to tell you that if your heart desires to do a triathlon, then yes you absolutely can. Believe me, if I can, anyone can. Many of you are already runners, so you’re 1/3 of the way there. Also, a huge bonus of being a runner is the fact that you have some endurance training, some strength, mental toughness and discipline—you’re arguably another 2/3 of the way there, really. We just need to make sure you can swim and ride a bike. Two “small” but big things, I know. When I decided to tackle a triathlon, I had two children under the age of two, worked full-time as an attorney and commuted 12 hours a week. Oh, and did I mention that I weighed about 250 pounds? Little by little, I kept working and I did, in fact, become a bona fide triathlete. I did my first short distance triathlon with very little skill, even less speed, but a whole lot of heart. I have now completed dozens and dozens of triathlons, including the IRONMAN distance (2.4-mile swim, 112-mile bike, and a 26.2-mile marathon run). Truly, if I can become a triathlete, so can you. A triathlon is a race that consists of swimming, cycling and running—usually in that order: swim first, then bike, then run. The sprint or mini-sprint distance triathlon race is the shortest distance triathlon. A “sprint tri,” as they are frequently called usually encompass a 300-800 yard swim, a 10-15 mile bike and a 5k (3.1 mile) or less run. The race distances will vary depending on the event, but that is the general distance. First Swim, Then Bike, Then Run? Correct. This is the typical order of a triathlon, which means you get out of the swim portion (usually in a river, lake or ocean) and hop on your bike—soaking wet. You have a space in between each event called “transition,” which is both a noun and a verb. The transition area (e.g., the noun) is the place where you put your bike and shoes, and smaller things like hats or towels. Then you “transition” (e.g., the verb), meaning you move from the swim to the bike (Transition 1), and then later, from the bike to the run (Transition 2). The announcer blows the whistle, everyone gets in the water, swim swim swim, everyone leaves the water, heads to Transition 1 to put on bike shoes or sneakers and a helmet. You then roll your bike out of transition, get on at the designated “mount line,” ride off on your bike, pedal pedal pedal, come back to transition, get off your bike (at the designated “dismount line”), put your bike back in its place in transition, take off your helmet, and put on your running shoes. Follow the signs out of transition, run run run all the way to the finish. How Do I Become A Triathlete? Step one to becoming a triathlete—even if you can’t run for a mile right now, swim the length of a pool or ride your bike without swearing your rear end will break—is believing that you can, and knowing that you will. Make the decision that you will become a triathlete, and the next step is to take some small, but consistent action toward that goal. Do you have a body, a bike and a pair of shoes? I’ll assume the body is a given. As for the shoes, I urge you to get fitted and buy proper shoes. The bike may seem like more of a challenge, but you can do your first sprint triathlon on any bike—road bike, mountain bike, hybrid, cheap, expensive—you don’t need a fancy bike. You should, however, have a quick tune-up on any bike that’s been gathering dust for more than a year, and even a very simple bike chat or fit with a bike specialist will make your experience much better. Along with the bike, you need a bike bag that attaches to your bike to carry tire tubes (in case of a flat tire) and air cartridges or a small pump. It’s necessary to learn how to change a tire tube and the basics of bike maintenance (YouTube is a great resource). Additionally, access to an indoor bike/class or bike trainer is helpful, as are padded (called “chamois”) shorts (cycling or triathlon shorts), a water bottle cage on the bike and bottles. Wear sunglasses to protect your eyes not just from the sun, but also from road debris and my personal nemesis, flying insects. For swimming, you will need access to a lap pool (25 yard minimum length, ideally), goggles, a swim cap, a one-piece fitted swimsuit and potentially, a wetsuit. For the bike and the run you can train in almost any comfortable clothing. Note that wicking material will be more comfortable and cause less chafing. Additionally, tight clothing—while not for the faint of heart—is actually functional for the sport. Form-fitting clothing prevents chafing and drag (on the bike, you can easily become a parachute if your top is too loose); it also wicks away sweat and moisture. For running, get fitted for proper shoes and find some socks you love. I also like wearing a visor to catch the sweat and keep the sun out of my eyes. What Do I Wear On Race Day? Wear a swimsuit in the race (with a sports bra underneath), throw on a pair of shorts for the bike and a tee or tank for the run. You’d keep your swimsuit on the whole time. Wear a very snug wicking tank and tri shorts for the whole race. In summary, you swim, bike and run without changing clothes (and you are wet most of the time). If the water temperatures are cold on race day, you may need a wetsuit. There are, however, many available resources on wetsuits in many different forums, including SwimBikeMom.com. Okay, I’m Still With You. How Do I Plan My Training? The first thing in staying consistent is planning. You can utilize a paper calendar or an online calendar like Google Calendar to plot out your workouts. You can also sign up for the free version of TrainingPeaks.com. Basically, you want to swim twice a week, bike twice a week and run twice a week, the best you can. If you can’t do that, then modify it. This is simply a suggestive framework. As you get further down your triathlon journey, you can add to this (in distance and in times). The best thing to do is pick a schedule for yourself that’s doable, as this sport thrives in consistency. Do not set your expectations so high that it’s impossible to meet them. Are you a morning person? Do you have more time in the evenings? What about childcare? Is your spouse or significant other on board with your plans? If not, are you prepared to adjust? These are some questions to ask to help frame your schedule. For a sprint triathlon, I would recommend a minimum of 12 weeks of training, if you’re a beginner. If you’re an advanced runner and cyclist, you can perhaps do a little less. If you are a great swimmer and runner, again, you might get by with fewer weeks of training. This is a general training framework for a woman who can run/walk a 5k, and who’s fairly new to swimming and biking. On the other hand, if you feel you need more than 12 weeks, take more time. Do whatever will make you feel comfortable come race day. 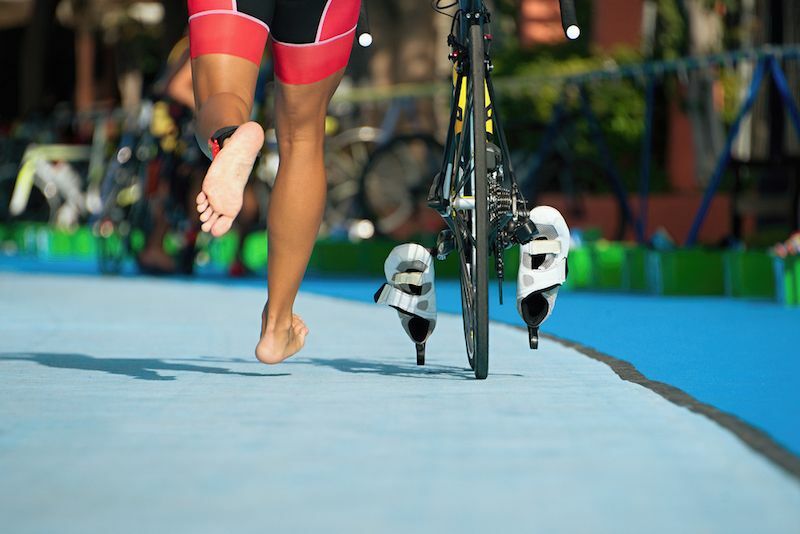 This is a general guide for getting you to the start (and finish) line of your first triathlon. If you are currently a marathon runner, you can keep your running routine intact and just follow the plan for swim and bike. If you are new to all three disciplines, remember to go easy, be patient with yourself, do the rest weeks, and have a great time. Ease into it. This week, swim one or two times, bike two times and run two times. Ideally, cover about 200-300 meters in the swim (over two workouts), 30 minutes (a minimum of 5 miles) on the bike each workout and 1 mile on each run. For the swim, most lap pools are 25 meters or yards in length. For swimming, a “length” is the distance from one end of the pool to the other. So, for 300 meters, that’s 12 lengths of the pool. 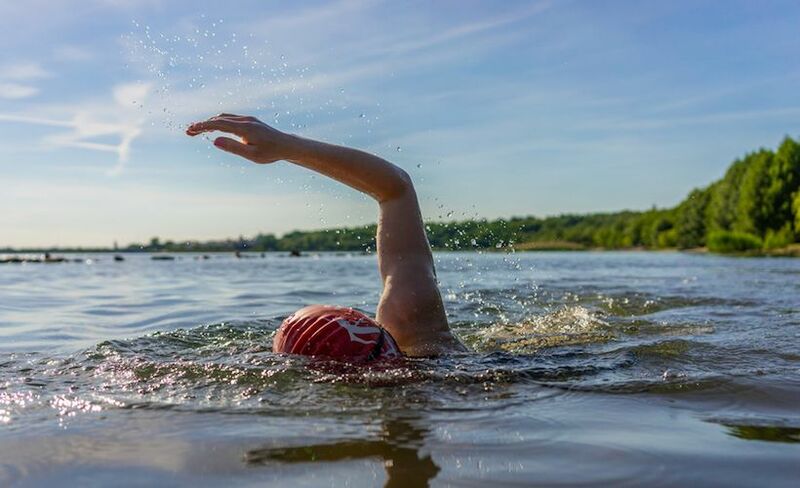 Traditionally, you want to use the “freestyle” or “front crawl” stroke in the swim; however, for your first race, if you are comfortable doing a combination of the breaststroke and freestyle, that’s fine as well. If you can’t swim at all, seek out a few swim lessons ahead of time. Again, let’s stick to two times a week for each workout. 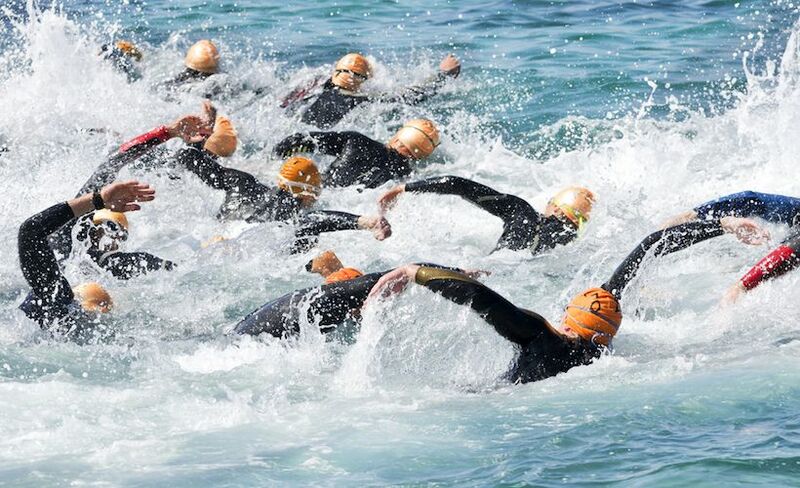 Ideally, cover about 300-400 meters in each swim, 45 minutes (a minimum of 8 miles) on each bike and 1 mile on each run. Again, keep it to two workouts for all three disciplines. Cover 400 meters in the swims, 10 miles (or 50 minutes) on the bikes and 1 to 2 miles on the runs. The purpose of recovery week is to give your body (and mind) a rest. This week, do one easy swim (400 meters), one easy bike (30 minutes or 8 miles) and one easy 1 mile run. Go back to two workouts per sport, but add a bonus workout called the “brick.” The “brick” means that you run immediately when you get off the bike. So after one cycling workout this week, add a short 5-10 minute run. Up your distance and time a little. This week, tackle 500 meters in each swim, 12 miles or one hour on each bike and 2 miles on the run. This week, do one easy swim (500 meters), one easy bike (40 minutes or 11 miles) and an easy 2 mile run (or walk). This is where you start practicing open water swims if your race will take place in an outside body of water. Try to swim in race-like conditions. If you’ll need a wetsuit, swim in it this week. Go with a friend (safety first), and be patient with yourself. Try to get to the open water to swim once a week between now and race day. For workouts, swim two times, bike two (or three) times and run three times this week. Remember to add in your brick workout once a week. In this cycle, make your brick run 15-25 minutes long. This week, let’s tackle 600-700 meters in each swim, 15 miles or 1:15 on each bike and 2-4 miles on each run. Swim twice, bike two (or three) times and run three times this week. Add in your brick workout once this week. Keep your brick run at 15-25 minutes long. Tackle 800 meters in the swims, 18 miles or 1:20 on the bikes, and 2-5 miles on the runs, with at least one run being 3 miles. Swim two times, bike three times, and run three times this week. Make your brick run 20-30 minutes long. Cover 800 meters for each swim, 15 miles or 1 hour for two bike workouts and 20 miles or 1:30 for one bike, and do 2-5 miles on each run, with at least one run being 3 miles. We want you rested for your race day. Do one or two easy swims, bike less than 30 minutes two times and run once or twice for 20 minutes or less. Long before race day, it would be helpful to read the USA Triathlon rules, an easy-to-read guidebook for beginners about triathlon (such as Triathlon for the Every Woman or Your First Triathlon by Joe Friel), and watch YouTube videos on swim and bike safety. A few days before the race, make sure you have everything you need (goggles, pumped tires, bag including tube). Practice your transitions and visualize your race success. On the morning of the race, stay positive and focus on your finish. No matter how slowly you go, just keep moving forward. Thank the volunteers and the folks who made your journey possible. Enjoy your race and know you accomplished something amazing. You’re a triathlete! Congratulations. Meredith Atwood (@SwimBikeMom)is a weekly contributor to Women’s Running. She is a four-time IRONMAN triathlete, recovering attorney, motivational speaker and author of Triathlon for the Every Woman. She is also the host of the hit podcast, The Same 24 Hours, a show which interviews interesting people who make the best of the 24 hours in each day. Meredith has two books coming out in the Spring and Fall of 2019. Read more at: SwimBikeMom.com.